Freshwater Diversions – Restore or Retreat, Inc.
Freshwater is channeled form a nearby river or waterbody into surrounding wetlands, and gates or siphons are used to regulate the volume of water flow. This infusion of water, sediment, and nutrients helps slow saltwater intrusion and promotes the growth of a new marsh. An example of a freshwater diversion is the Davis Pond Freshwater Diversion (BA-01). 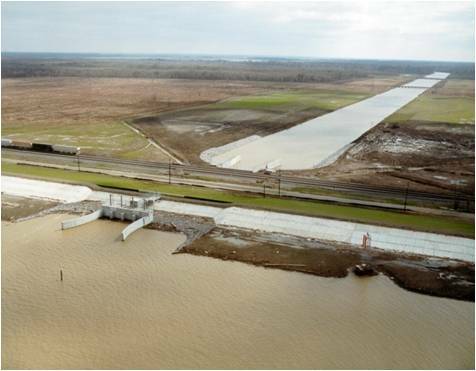 The Davis Pond Freshwater Diversion Structure, completed in 2002, was intended to imitate historic spring floods, providing a controlled flow of fresh water and nutrients from the Mississippi River into a target area in the Barataria Bay estuary. Located on the west bank of St. Charles Parish, two miles below Luling, Davis Pond is expected to restore former ecological conditions by combating land loss, enhancing vegetation and improving fish and wildlife habitat. The project consists of four iron-gated 14′ x 14′ box culverts built into the Mississippi River levee. An inflow directs river water into the structure, while an outflow channel extends behind the structure into the ponding area and, ultimately, into the estuary. The total project area comprises 10,084 acres, including the 9,200-acre ponding area. Davis Pond is able to divert up to 10,650 cubic feet per second (cfs) of fresh water. Diversions through the structure will occur under regulated conditions determined by monitoring basin salinities and fish and wildlife resources. Davis Pond is a feature of the Mississippi Delta Region Project, and was authorized by the Flood Control Act of 1965 and modified by the Water Resources Development Acts of 1974, 1986 and 1996. The total cost of the project is $120 million, with the federal government paying 75% and the state paying 25%. Real time data on the project can be found here, including current discharge, temperature, and salinity. Left: The Diversion Subcommittee of the Governor’s Advisory Commission visits Davis Pond in Spring 2015. 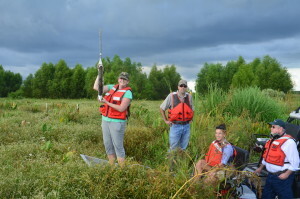 This restoration feature study would assess changes in the operation of the Davis Pond project to increase wetland creation and restoration outputs. Modified operation of this structure could potentially result in an increase in the freshwater introduction rate, perhaps 5,000 cfs [178 cms] on average, to accommodate the wetland building function of the system. 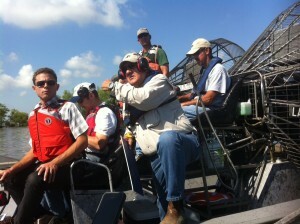 This study would identify changes to feature’s operation that would increase restoration outputs. The introduction of additional freshwater would facilitate organic and sediment deposition, improve biological productivity, and prevent further deterioration of the marshes. This feature is located in the vicinity of a historic crevasse. Any proposed change in purpose that would require modification of the existing project authorization would be submitted for Congressional approval. 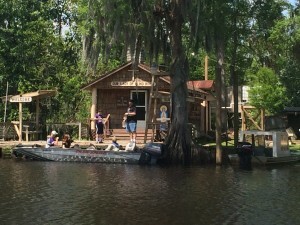 The Louisiana Coastal Protection and Restoration Authority voted to send “River Reintroduction into Maurepas Swamp” as one of five projects to the RESTORE Council for “bucket 2″ funding. Each RESTORE Council member can submit up to five projects. This project, also known as the Maurepas diversion or the West Maurepas Diversion (and associated with Hope Canal early in its history), is designed to restore systems and processes that served the swamp before levees restrained the Mississippi River. 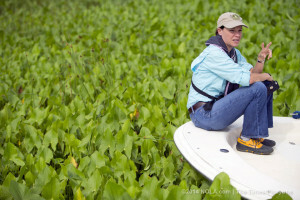 The project has a long history in coastal restoration planning, starting with the The Louisiana Coastal Restoration Plan in 1993, the Louisiana Coast 2050 report in 1998, the Mississippi River Sediment, Nutrient and Freshwater Diversion Study in 1999, and both Coastal Master Plans in 2007 and 2012. 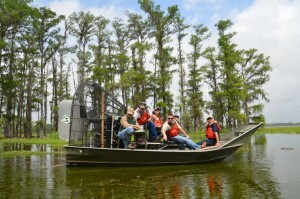 For more information, please check out our partners at Louisiana Wildlife Federation for their comprehensive look at the project. 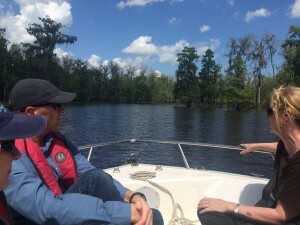 Left: Members of the Diversion Subcommittee joined RESTORE Council staff to view the Maurepas project area in Spring 2015. 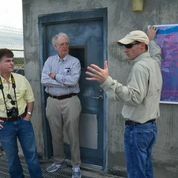 The relic of an LCA project called Increase Atchfalaya into Northern Terrebonne Marshes, this state-driven hydrologic diversion project has an that area stretches from the Atchafalaya River eastward to the Houma Navigation Canal, which is part of the Gulf Intracoastal Waterway system, and eastward to Lafourche Parish. The marshes in the influence area are nearly equidistant between the Mississippi and Atchafalaya Rivers and are blocked from significant amounts of river water and sediment. As a result of saltwater intrusion and sediment starvation, these marshes have been rapidly converted to open water. This project would dredge and deepen the Gulf Intracoastal Waterway to increase the flow of fresh water eastward from the Atchafalaya River at a rate of upwards of 10,000 cfs to help sustain Terrebonne marshes. 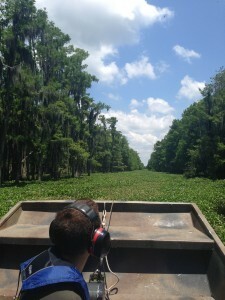 Dredge material will be used beneficially for marsh creation in targeted areas. The CPRA project management team has completed more advanced 2D modeling on a narrowed field of project alternatives, and have a selected plan they wish to proceed with. As part of the project development team, ROR has assisted the state in hosting several stakeholder meetings and field trip as part of the project, and the next is scheduled for August in Morgan City. Click on this link for the project update provided by the project manager to CPRA and the Governor’s Advisory Commission.